This is my 1st official blog post for 2017 (not including My Year in Review for 2016) and it’s already the month of February 2017, which means winter is half over…:) With Chinese New Year’s 2 weeks ago, this is technically the start of my New Year’s and the start of the Year of the Rooster, which I was born in. I’m excited that it is MY year, the Year of the Roosters & looking forward to what this exciting year will bring me!! Most of all, I look forward to discovering new foodie & healthy bakeries & sharing my sweet adventures with my readers. Starting off this Chinese New Year and the Year of the Rooster, I thought in honor of this special occasion to share my love for pho and a Vietnamese type of cuisine, which is also part of the Asian cuisine/culture. I thought it would be perfect to match this type of food with Chinese New Year as noodles in the Chinese culture represent happiness and longevity. I believe that this is a great way to start the New Year with delicious & simple food that represents happiness and a healthy long life. 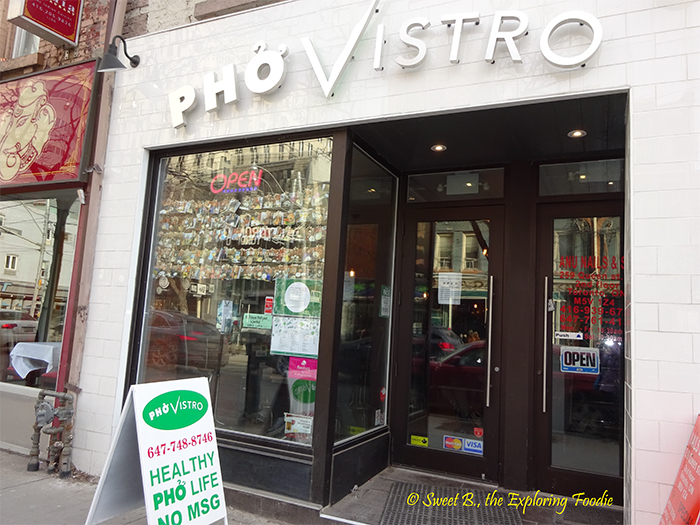 I recently discovered a new healthy, simple and delicious Vietnamese pho restaurant called: Pho Vistro on Queen Street West. 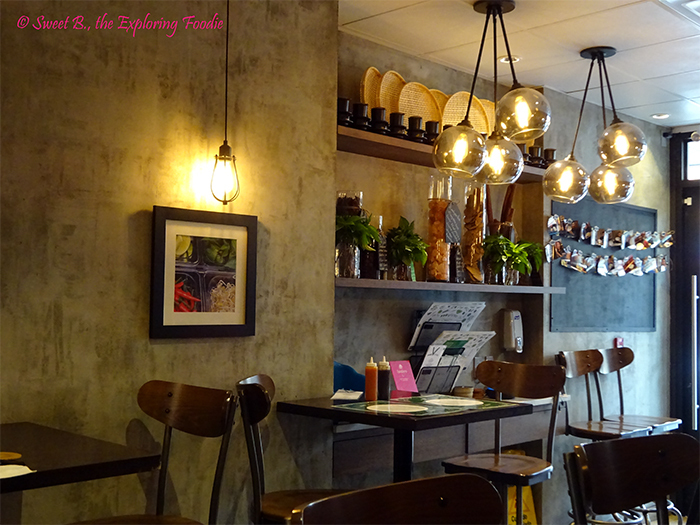 They are not like any other pho place, their focused is on all-natural, organic and old-fashioned Vietnamese cuisine with zero MSG and their traditional broth is slow-cooked with intense flavoured broth that takes over 10 hours of cooking process with fresh herbs/spices. They offer an assortment of Vegan menu options along with gluten free, which is rare for a pho place and believe that this is a great option to add. 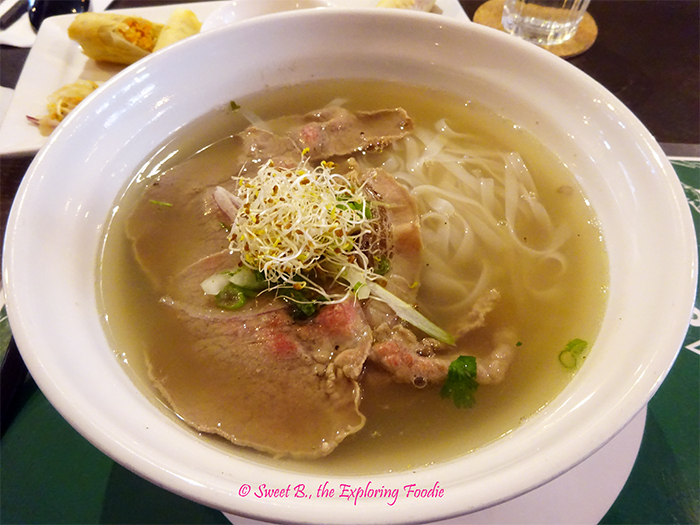 They consider their pho soup to be a healthy alternative to other soups to help your immune system. I believe that this is a great concept to have in this type of food as it is rare and I love the option of having vegan options. 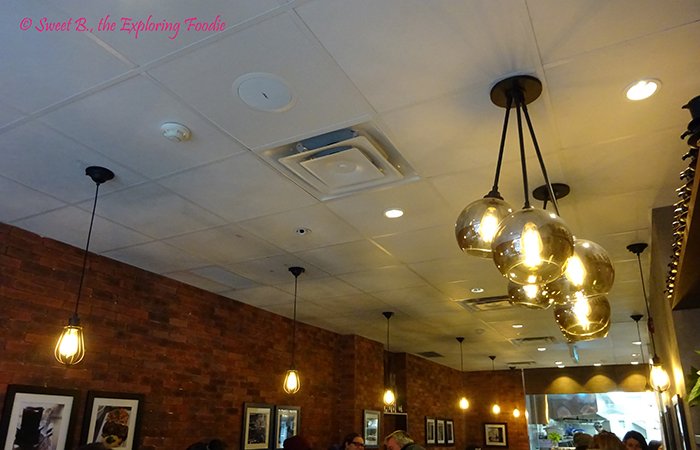 Last weekend, it was my first time trying this cozy & warm new pho place, Pho Vistro and when you walk in the door, the first thing I noticed was their beautiful interior design and loved the modern yet home feeling to this medium size restaurant. You can smell the aroma of their freshly made broth as well when you come in. I thought that the size of the restaurant was a good fit as it wasn’t too big or too small. I came just after the lunch rush as I was having a late lunch. It was still relatively busy and more customers arrived after I sat down so I would consider this a good sign that people really enjoy the pho here. 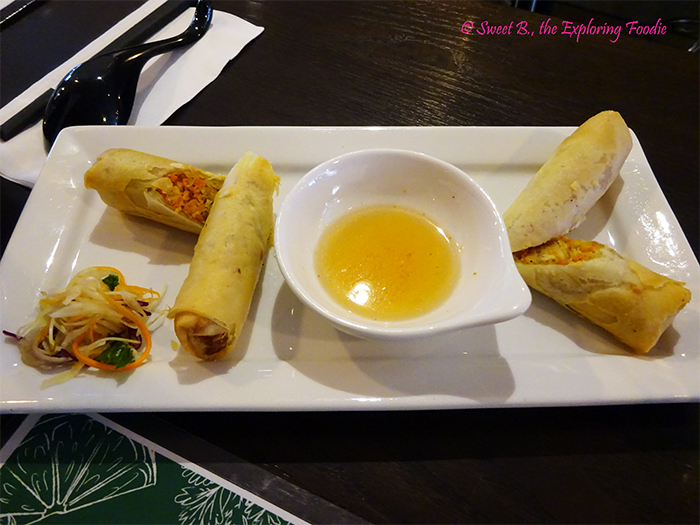 I ordered the Fried Chicken Spring Rolls to start and ordered the Pho Classic with beef, they also had options with chicken and vegan as well. They also have smoothies with option for vegan/sugar-free as well, which is great to know next time I would love to order one since I only drink dairy-free now. The pho itself I really liked it, I can tell the broth was freshly made and can tell there was definitely no MSG in it, I felt the cleanse / clear of the broth thou this broth had less flavor than other broths I usually eat and I believe that has to do with no MSG in it as it is more healthier. I added a bit of hoisin sauce on my beef for a bit of more flavor. I loved the noodles itself as I can tell it was made fresh and it is the thicker noodles than other pho places have thinner noodles. 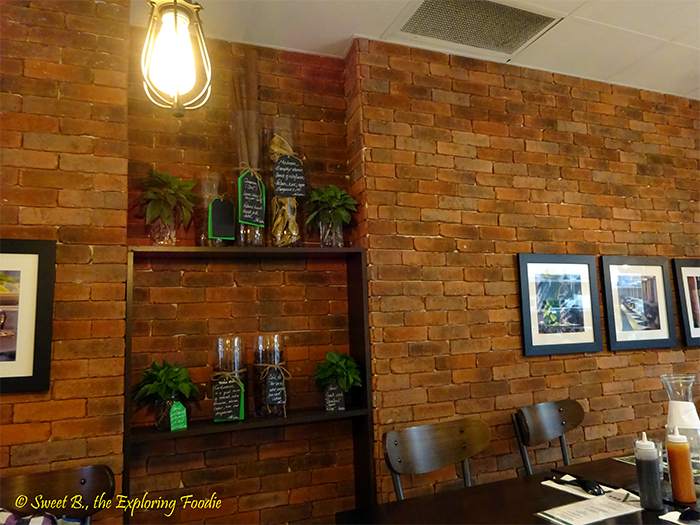 They have excellent customer service at Pho Vistro, very friendly and efficient servers and the owner who I saw is very friendly as well engaging with customers and assisting with staff if they required help. Overall, I would definitely come back for a hot bowl of pho especially on these colder winter days we are now having. 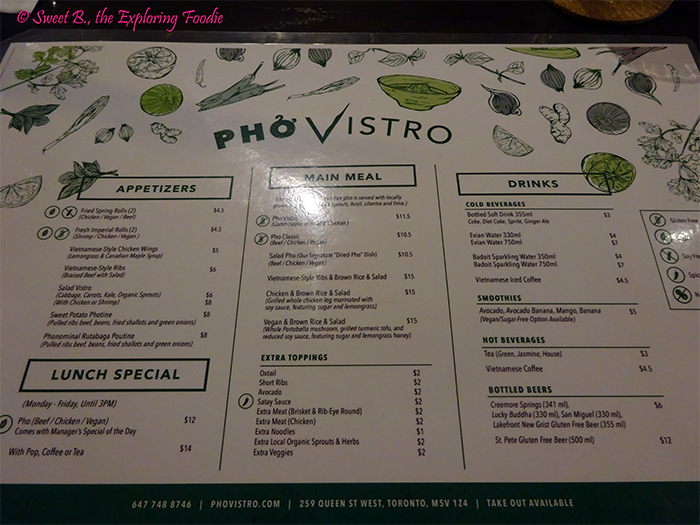 I been to many Vietnamese (pho) restaurants before and I definitely think this is one I would recommend people to come and try for yourself as Pho Vistro stands out to me more particularly with their concept and healthier version of pho soup. I look forward to coming back and enjoying some delicious & healthy bowl of pho this winter and anytime during the year as I enjoy my pho all year round. 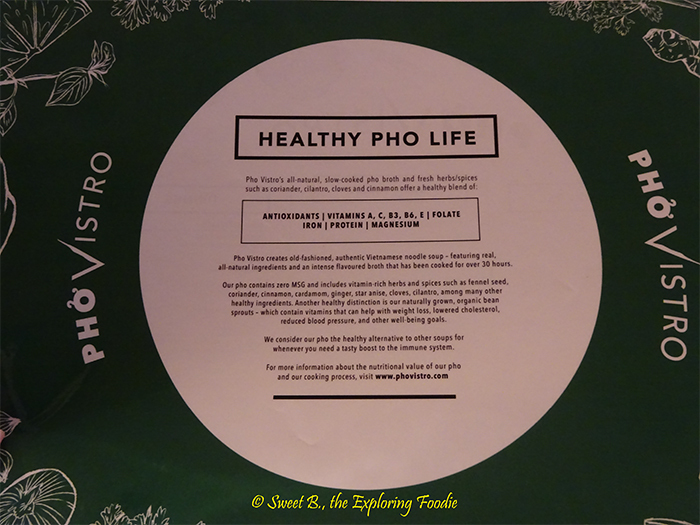 I hope that you all give Pho Vistro a try and see for yourself why I love this pho place so much! Please let me know what you think of it by leaving your comments below. Don’t forget to stay connected with me for all updates, when my next blog post is and follow my yummy foodie photo adventures, you can follow me on Twitter @SweetBFoodie24 and Instagram @SweetBFoodie24. You can also follow them on Twitter @phovistro, Facebook @phovistro and Instagram @phovistro. Hi, welcome to my blog! My name is Bonnie and I love desserts & sweets!! I have quite the sweet tooth! I love to discover new places to fulfill my sweet cravings and sharing my food experiences with others, which is why I started this blog! I'm Half Vegan as I follow a dairy free diet because of my food sensitivities. I still love my sweets and desserts, but now I discover new dairy free desserts and even healthier desserts that still taste delicious & sweet to share with my readers. I also love discovering new Vegan places too. Along with my passion for travelling & attending food events, makes up my blog to share with you. 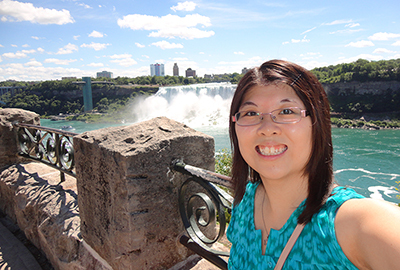 Please join me in my sweet foodie discovery one adventure at a time! Thanks everyone for dropping by!! I hope that you enjoy your sweet visit! Please do drop me a comment to say hi or any of your thoughts or a suggestion for me to try a new place! I love to hear from you! !